Watch the intro now for free! The next series of worship guitar lessons, London start up in May, 2019. The beginners worship guitar course, based in London, is a very practical, song-based introduction to worship guitar playing. The course requires no previous knowledge of the instrument. In the first few sessions the entire of the Beginners course is revised. We then go on to look at ‘barre’ chords and the concept of moving chord shapes around the fret board, all demonstrated with appropriate songs. The Intermediate worship guitar course consolidates musical material that was introduced on the Improvers worship guitar course. 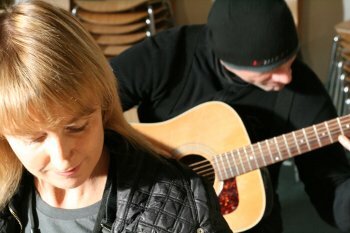 For those people who have completed the Intermediate worship guitar course, are starting to take the guitar more seriously, and fancy progressing further. The Advanced 2 worship guitar course builds on material covered in earlier courses and is designed for those that are committed to playing the guitar and want to push their skills further. We will look at playing solos, of course, but that doesn’t happen so often in the worship context – It’s often more a matter of finding something that compliments the song and adds to what the rhythm player is doing. So how do you get started with writing a song? We’ll look at some very practical, hands-on ways of getting kick-started with songwriting. We’ll look at techniques to craft melody, chord sequences, rhythm and lyrics. The worship guitar lessons run three times a year at HTB and other London churches during term times. Some people want to learn the guitar for their own personal worship, whereas some would like to go on to lead others. Over 1,000 guitarists have made a start on the HTB worship guitar course. Many of these have progressed to the improvers and advanced worship guitar lessons, to lead worship in local churches, play in church bands, lead worship in a variety of contexts, even play in the band at major London churches! These music courses are a hands-on/practical training resource to complement theological teaching on worship. They are not just guitar lessons but worship guitar lessons. At the worship guitar lessons students learn a repertoire of worship songs and in doing so learn the basic, rudimentary skills necessary to get going as a worship leader. NEW! check out the details for the new term here. B. Mus., M.A., Ph. D.
Simon Nelson has been a professional guitarist for 30 years. Simon has lived and toured all over the world, including the USA, Bermuda and Australia. Initially self taught, he later felt he ought to “know” something about music, and took a Bachelor of Music degree at Goldsmiths College, a Master of Arts at City University and a Ph.D. in Ethnomusicology at City University. For the latter he wrote a thesis on the origins and evolution of blues guitar. As a session musician Simon has recorded for the ABC in Australia, and the BBC in the UK. He has played in a touring band at Birmingham, Manchester, Sheffield, Belfast and Newcastle Arenas, the O2 and the Albert Hall with Joss Stone, Ms. Dynamite, Heather Small, Beverley Knight, Paul Jones (Manfred Mann), Des’ree, Alexandra Burke, Helen Shapiro, Candi Staton, Mavis Staples, and Jocelyn Brown. 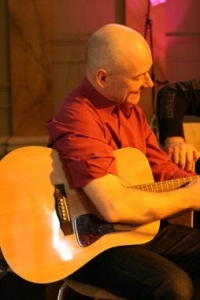 In a worship context Simon has played in bands with Andy Piercy, Charlie Groves, Nick Herbert and Nick Drake. He has been in Dave Bilbrough’s band since 1997, appearing on Dave’s last 6 albums – including the award winning DVD This Is My Worship and People Of Promise. He has appeared regularly on The God Channel and Songs of Praise. He has recently appeared on Songs of Praise playing with Dana, Candi Staton, Paul Jones and Mavis Staples. Simon plays original music with his co-writer / brother Steve Nelson – www.nelsonbrothers.co.uk. The two brothers are also currently playing in an original band (Sadie and the Hotheads) with Oscar nominated Hollywood actress Elizabeth McGovern (Downton Abbey). 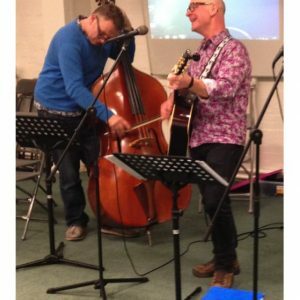 Simon has taught guitar for 20 years, and has, over the last 10 years, taught courses in guitar in the worship context for Holy Trinity Brompton (HTB), Kensington Temple, St. Michael’s Chester Square, St. Mary’s Bryanston Square and Oasis, Colliers Wood. ”The guitar course has had a wonderful impact, encouraging many to develop their skills. This DVD will be an amazing resource for many. Enjoy. ”The guitar course has released many worship leaders in our church. It captures those who have a heart for worship and equips them to have the skills to lead others in praise. 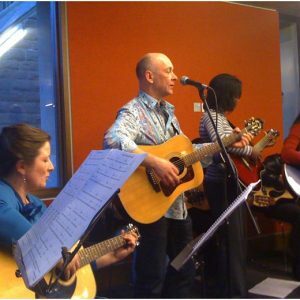 ”Simon is a hugely gifted & accessible teacher who’ll take your guitar playing to another level. Please tell us your 3 favourite worship songs.